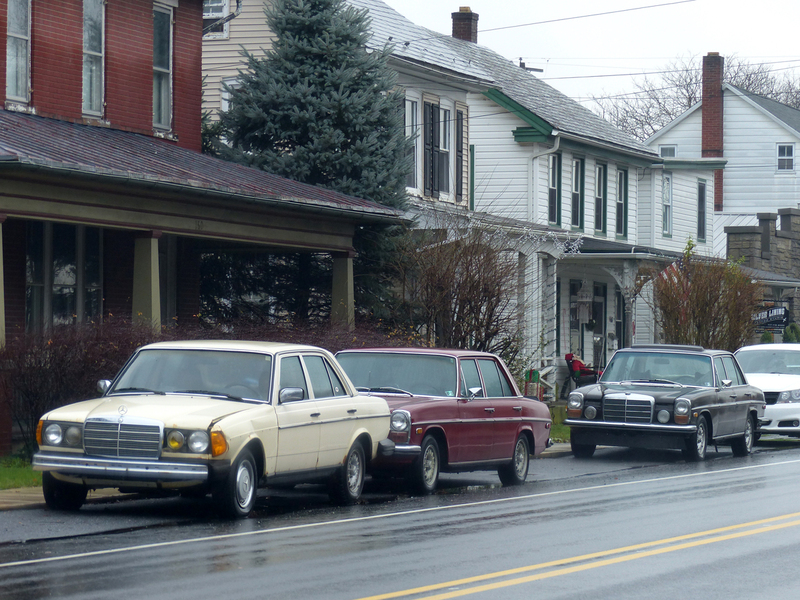 Spoiled for choice: a well-used W123 and two W114/115s. Maybe the red one belongs to the exhausted Santa in the background. Spotted in Landisville, PA on 29 December, 2015. It was nice when the newer style of a car just looked more modern and had not gained so much size that it looked like it could eat it’s ancestor. With that said, I always liked the W114/115 over later models, maybe because they always seemed to be the preferred transport of henchmen in a James Bond film. I don’t know, the black 504 Pugs did a good job of chasing the 2CV in For Your Eyes Only. A good runner up were the Datsun 410? chasing Bond in a convertible Toyota 2000GT in You only Live Twice. It was when Japanese cars were still mostly unfamiliar but were Italan styled and so not completely strange. Remember at the end of the scene a Kawasaki KV107 helicopter, a license made Boeing Vertol Sea Knight, picks the up the Datsun with a big magnet and drops it in Tokyo Bay. I thought that was a Toyota Crown. The W114/115 series was designed by Paul Bracq, and have a timeless classic elegance that its successor lacked. I remember that Paul Bracq said that he did not design Mercedes Benz cars to be instantly appealing and that he designed one element that did not initially fit the design.But the more you looked at your Benz then it would over time become a better looking car.They were my words,not his.A friend of my father bought a new 1973 250 W114/5 sedan,white with tan MBTex interior.Was a great looking car with its rectangular headlights.The round USA headlights spoil the frontal appearance.Someone I worked with was about to retire and he bought a MB 280 sedan,bright orange,a very fast car,he liked it but complained of its fuel consumption if you used that power.I prefer the above Benzes to the later model W123. They were instantly appealing at least to me, I remember as a 7 year old the first time I saw a dark blue W114 250 in my neighbourhood and a bit later a white coupe, I liked them both for the same reasons I like them today. On the other hand I despise everything MB builds today, with the possible exception of the G-class. Yes, I saw a pristine W116 450SEL a few days ago. It had a commanding presence and elegance that no other cars from 1980s onward has. Not even plastic-cladded W126. I persuaded my father to start restoring his 1977 450SEL so we could do Sunday drive in style. What surprised me the most was seeing the continued use of W123 as taxicabs here in Germany. Almost all of them have H affixed to the numberplates, denoting them as antique vehicles and exempting them from the emission control requirements and driving restrictions. And the W124 that replaced the W123 was actually smaller externally, and quite a bit lighter. Hahaa… Well said, Jon C.
Since then the Camry got fatter and fatter, except when it went on a diet in 1997-2001, and got leaner and lower, then in 2002, the high sided whale surfaced again, and kept getting chunky. I’m a W-123 man my self , I looked really hard at the 114/115’s but they’re too stodgy even for me . “Too stodgy even for me” Ha! Agreed, my first Mercedes was the W114 coupe, a ’74 280C, tobacco brown with a bamboo interior. Sharp looking, but it just felt clunky and drove like a sloth, and somebody once described it to me as “a quintessential doctor’s car.” Never lived that down. My next venture into Mercedes territory was a new W123 ’83 300CD, midnight blue with a palomino interior, great car (other than the killer maintenance), loved the classic looks of that one. Good catch. They all look like drivers, as the 123 has front body damage, and both of the others appear to have rear damage. Probably victims of winter driving. There is a later model, big bumpered 114/115 in my neighborhood I need to get a photo of. It is usually parked off the street. Maybe someday I can catch it at the curb. Never thought red was an appropriate “Mercedes” color, and yet here it is, looking uniquely classy. It transforms the E convertible as well, from semi-stately (silver, gray family) to sporty. I think the W124 will become another appreciated mercedes classic, in good time. This 1994 of mine just got through the annual government car test with only new front brakes and discs needing attention. Total cost was U$80 for parts and U$200 in labour; including tidying and preparing the car; a day at the garage. 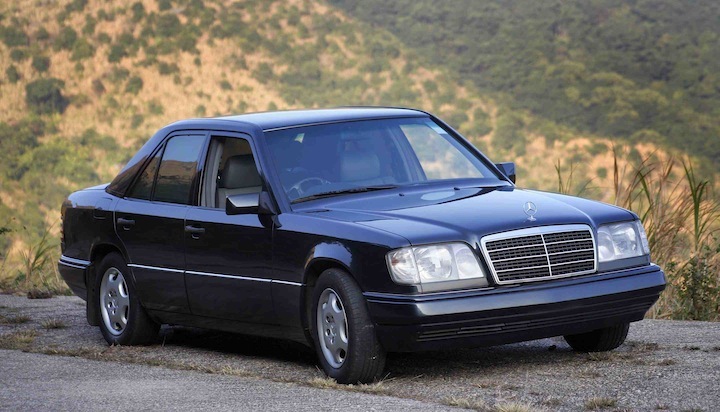 I think it’s become an appreciated “modern classic” already, in no small part due to the cost-cutting and quality decline between the W124 and the successor W210.